President Bill Clinton's administration had "no higher priority" than combating terrorists while the Bush administration made it "an important issue but not an urgent issue," said Richard Clarke, who advised both presidents. He testified Wednesday before the commission investigating the Sept. 11 attacks, the worst terrorist strikes in American history. Clarke's testimony turned what had been a painstaking, bipartisan probe of pre-Sept. 11 intelligence failures and bureaucratic miscommunications into a nationally televised criticism of Bush, who has made the terrorism issue the core of his campaign for a new term. Clarke slid into the witness chair for widely anticipated testimony just days after publishing a book that criticized Mr. Bush's response to the threat of terrorism. (The book's publisher and CBSNews.com are both owned by Viacom). The White House has sharply criticized the book and mounted a counteroffensive against its author. over Clarke's charges, and again sent top officials to deny that the administration ignored the terrorist threat, reports CBS News Correspondent Bill Plante. Aides accused Clarke of changing his story to sell his book. "What he is reporting ... does not reflect the reality that I know to be true. and I've spent a lot of time with the president. I've been in almost every one of his intel briefings,'' White House aide Andrew Card told CBS News. "What he alleges is not the fact." "He needs to get his story straight," said Condoleezza Rice, Bush's national security adviser and Clarke's boss while he served in the administration. Former Illinois Gov. Jim Thompson, a Republican, took up the president's cause inside the commission hearing. "We have your book and we have your press briefing of August 2002. Which is true?" he challenged the witness. Clarke's testimony overshadowed the release of a commission staff report that said bureaucratic disagreements about the extent of the CIA's authority to kill Osama bin Laden hampered efforts to eliminate al Qaeda's leader during the Clinton era. The result was a continued reliance on local forces in Afghanistan that all sides recognized reduced the chance of success, both before and after Bush took office, the report added. "If officers at all levels questioned the effectiveness of the most active strategy the policy-makers were employing to defeat the terrorist enemy, the commission needs to ask why that strategy remained largely unchanged throughout the period leading up to 9-11," it concluded. Officials from Clinton's National Security Council told investigators the CIA had sufficient authority to assassinate al Qaeda, the report said, but Director George Tenet and other spy agency officials "believed the only acceptable context for killing bin Laden was a credible capture operation." Sandy Berger, Clinton's national security adviser, testified that the former president gave the CIA "every inch of authorization that it asked for" to kill bin Laden. "There could have not been any doubt about what President Clinton's intent was after he fired 60 Tomahawk cruise missiles at bin Laden in August 1998," Berger said, referring to strikes at a camp in Afghanistan where the al Qaeda leader was believed present. Bin Laden escaped. Tenet, who preceded Berger in the witness chair, also was asked about the issue of authorization to kill bin Laden. "I never went back and said, 'I don't have all the authorities I need,"' he replied. Tenet said that even if bin Laden had been captured or killed in 2001, he did not think it would have prevented the 9-11 attacks, an assertion that mirrored testimony by Defense Secretary Donald Rumsfeld and Secretary of State Colin Powell on Tuesday. Tenet's tenure has spanned two administrations. And unlike Clarke, he praised aides to both presidents for their attentiveness to terrorism. "Clearly there was no lack of care or focus in the face of one of the greatest dangers our country has ever faced" after the Bush administration took office, he said. to "the loved ones of the victims of 9-11. ... Your government failed you. Those entrusted with protecting you failed you and I failed you." Some family members in the audience dabbed their eyes as he uttered the words. 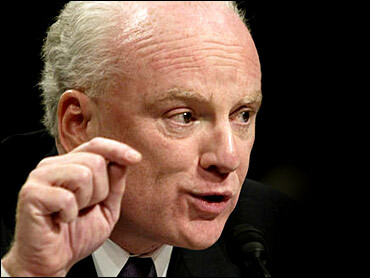 In the course of his testimony, Clarke criticized the FBI, the CIA and Congress as well as the Bush administration. Despite his catalogue of complaints, he said under questioning by former Republican Sen. Slade Gorton that nothing he proposed to Bush officials would have prevented the attacks on Sept. 11, 2001. More than 3,000 people were killed that day when terrorists flew hijacked planes into the twin World Trade Center towers in New York and the Pentagon outside Washington. Another plane crashed in a field outside Pittsburgh as passengers struggled with the terrorists aboard. Clarke said that early in the Bush administration, he had tried to persuade officials to make the elimination of al Qaeda official government policy. "I was told ... that was overly ambitious and that we should take the word 'eliminate' out and say `significantly erode,"' he recalled. Later, after the terrorists struck, he said, "we were able to go back to my language of eliminate, rather than significantly erode." A second question from Gorton prompted Clarke to raise the issue of the USS Cole, a warship bombed while refueling in a harbor at Aden, Yemen. Seventeen sailors were killed in the attack, later blamed on al Qaeda. The former White House aide said he suggested the month Bush took office that "the Cole case was still out there" and suggested retaliation.